We will fuel and start this machine to ensure its running correctly prior to dispatch, it will then be drained of fuel for transport. Improvements to this machine over the DPC6430 are 1.2kg lighter and enhanced air filtration. 305mm wheel diameter, 20mm arbor. 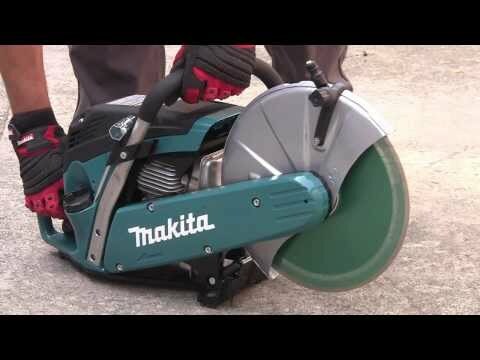 The Makita EK6100 stone saw has a wheel diameter of 305mm and a 20mm arbor. This machine has a 110mm maximum cutting depth. It has a 2 stroke engine. It features a touch and stop switch, spring assisted reciol starter, fuel primer for easy starting, water supply with intake filter and fine adjustment for adequate dust protection. 8.5kg net weight, 3.2kw/4.3hp power rating. 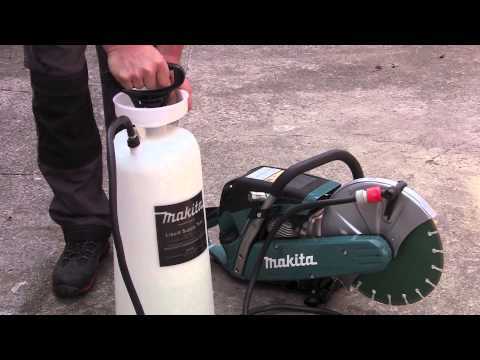 Makita 3 year service plan available on this machine when registered on Makita's website within 30 days of purchase. The service plan consists of three 12 month periods. The replacement and fitting of specific service component parts within each 12 month period if required: 1 off cylinder and piston, 1 off spark plug, 1 off starter rope, 1 off fuel filter, 1 off v belt. The petrol cut off saw must be registered with Makita to participate in this 3 year service plan. Free servicing up to £510.00. Great tool for roof tiling, not to heavy and plenty of power .